From the San Francisco Bay Area to the San Juan Islands, we've designed comfortable and livable homes for families of all shapes and sizes. 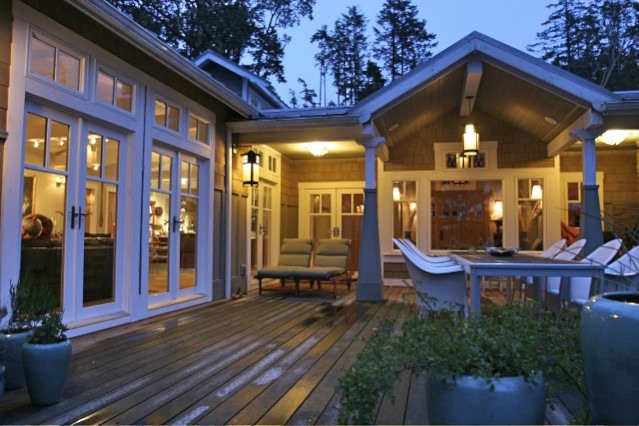 We have extensive experience designing vernacular styles of architecture. Log and Timberframe. If you need a historic look, no matter the style, we can integrate it with flare. Architect with over 35 years experience in residential design of New Construction, Additions and Remodels. Every project is unique, and as a licensed architect in California and Washington, I use a systematic design process that takes you from Design Development to Permit then Construction Documents. We will meet on site for a free one hour consultation to discuss your needs, goals, and budget for the project. I have a resume that I can email to you with local references upon request. A standard AIA contract is next be signed to proceed with a retainer. This agreement spells out the fees and description of the work to be completed. If you have gathered photos of things that you would like to incorporate in your design, this is always very helpful to communicate the final result intended. If you can write up a description of your project and the goals that you are trying to achieve, that always makes it easier. I have a form to fill out if that can help you to organize your goals-just let me know and I will send it to you. We can also share/collaborate on an image board on HOUZZ of ideas that you like. 3D Models can help the client to visualize the proposed changes. Sections thru the building help to define the connections and which details have to be worked out. Once the site is measured up and existing floor plans are generated (computer aided design-CAD drawings), design options are generated that meet your program for the site. We utilize computer graphics and 3D modeling in order to communicate the ideas to you. Once a design is agree upon, exterior elevations are produced if applicable to show what it all would look like from the exterior of the building. I design from the "Inside Out" to make sure that a design first works for flow and optimal use, then make sure that it also looks good from the outside. This is the part of the project where we really figure out how the project will be built. The electrical plan is generated, plumbing locations, interior elevations, and details will be generated to explain to the permit inspector how the project meets current planning and building codes. If necessary, a structural engineer will be called in to do coordinating drawings. All the drawings required to get a permit (or if Design Review is required first), will be generated and approved step by step. Once the permit is applied for, we will help you get bids from contractors. If you have a contractor that you have worked with and you want to work collaboratively from the beginning, that is great too. We will help you through the construction process and be involved as much as you want us to be. Fixtures, finishes, cabinetry, lighting, furniture, color- all the details can be specified in advance or selected together if you need more help. You may do as much or as little as your needs dictate. We can take care of everything or hand the project over to you to manage the details. It is totally up to you as to how you want to work with us. We take great pleasure in your satisfaction and appreciate your reviews on all social media about your project on HOUZZ, YELP, YEXT, FACEBOOK, TWITTER, PINTEREST, ect..